In this installment of the sump series, I will discuss the specifics on how to optimize overflow design and placement, and delve into some of the problems associated with sumps. I will also provide some potential solutions to problems one may likely encounter. It is not necessary to have read Parts I or II of the series before reading this article, but I encourage readers to do so. Part I covers the definition of a sump, why they are useful and the basic mechanics. Part II specifically discusses the design and installation of the sump itself, including hints on how to choose the size, shape, and material for a sump. All overflows have a standpipe, sometimes referred to as a drainpipe, which is a vertical pipe that drains water out of the tank. It is quite possible to use a properly elevated standpipe as an overflow without any further complications (see Figure 1 below). This type of standpipe is very simple and easy to install. Figure 1. A simple standpipe. Photo courtesy of Ryan Baker (rbaker). The major drawbacks associated with this simple type of overflow are that they are relatively noisy and are more difficult to conceal. For these reasons the idea of putting a "box" around the standpipe emerged. The box produces a few nice side effects. 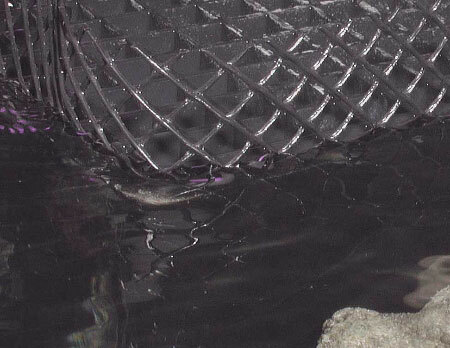 The first is that it allows a "thinner" area of water to be skimmed off the surface of the aquarium into the sump. This is desirable for a number of reasons. 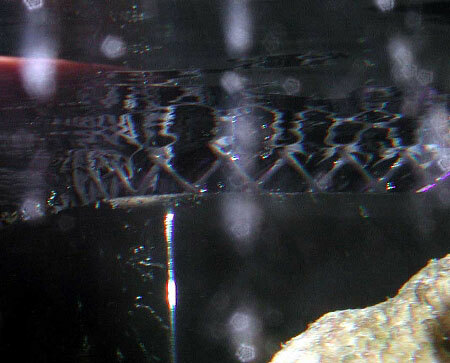 Aquariums will accumulate a film of organic material on the surface of the water that will both block gas exchange and reduce light penetration. Both of these things are extremely important in a reef aquarium. Reducing the "thickness" of the water falling over the wall as much as possible increases the rate that this film is removed. Second, the sound level of the water cascading into the overflow box is much lower when the thickness of the water overflowing is smaller. A good analogy is to turn your faucet on very slowly and increase it to fully open. When there is a small stream of water coming out it is relatively quiet, but when it nears full force, the sound volume goes up dramatically. And lastly, the box puts the standpipe in an isolated area that, if necessary, can be repaired or maintained without emptying the entire tank. It is important to properly size the height of the standpipe in the overflow box while taking into account that if it is too short, the water falling into the overflow box will cause too much noise. On the other hand, if the water level is raised too high, the risk of flood may be increased beyond reasonable comfort levels. The best rule of thumb is to try different heights and use the lowest height possible that will still provide acceptable noise levels. More sophisticated ways of quieting the overflow and standpipe will be detailed in future installments. Many people use glue to connect the PVC that makes up the standpipe inside the overflow box. I highly recommend against doing so. Since all the parts are inside the aquarium, there is no worry that a small leak will cause a problem; leaving the parts unglued allows for simple adjustments in the future if problems occur or if things need to be arranged differently. Placement of the overflow is largely dependent on the size of the tank, the way the tank is displayed (i.e., installed in a wall, or viewed from both sides as a room divider), and whether the aquarium is already drilled. Obviously, if the aquarium is already drilled and has an overflow installed, it would be smart to try to work with the holes and overflow already provided. The ideal overflow box would span the entire length of the tank providing the maximum possible linear overflow. This scenario would allow for a large volume of water to flow into the box in an extremely thin layer. This is a technique frequently used in public aquaria where there is plenty of space to sacrifice to the overflow box. The typical home aquarist, however, is unwilling to devote so much precious real estate to an overflow, so we generally make do with less than the ideal. There is a "rule of thumb" calculator accessible here, to help guide you in determining the best size for an overflow box. "Linear inches" is the total length of the top rim of the overflow box. For example, if a corner overflow sticks out from the back wall 6" and extends from the side glass 6", then there is 12 linear inches of overflow. If there is another box exactly like that on the other side of the tank, then the tank would have 24 linear inches. The ideal would most certainly not work for my display tank because I use my tank as a room divider, and it can be viewed from three sides; both "lengths" of the tank and one end are plainly viewable. This limits overflow placement to only one end of the tank and definitely makes it a challenge to provide an adequate "linear" overflow area. In fact, I have substantially less linear inches than the calculator recommends, and I have all the hassles that accompany that violation. I have spent many hours tuning my system so that it will properly skim the water's surface, avoid capturing any animals that come anywhere nearby, and yet still deal with noise-related issues. My point is that ideal linear overflow size is not a physical law; however, it makes life easier if you do your best to accommodate it. For the typically configured tank where the tank is against the wall with the front and two sides visible, the standard overflow layouts have either one overflow in a back corner or dual overflows with an overflow box in each back corner. 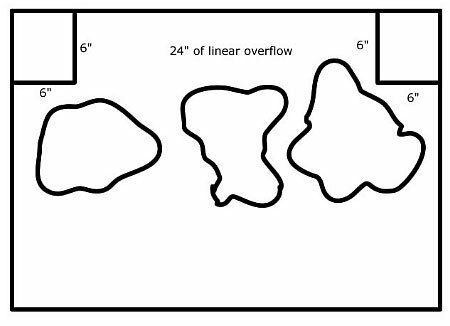 Having two overflows is better because of the increased linear overflow area, but also, because it provides multiple drains. Multiple drains are useful because they can more efficiently handle larger volumes of water, and do so more efficiently and quietly. Another very good reason to have two drains is for flood avoidance. If a foreign object clogs one drain, then the other drain can keep water flowing. If there is only one drain and it becomes clogged, a flood is the typical result. With two drains, especially if they are properly sized, the tank will be much less likely to overflow. I highly recommend having multiple drains in any configuration! In the typical configuration the "standard" overflow layouts are far from ideal in terms of the visual display. When viewing the tank from the side, the overflow box is clearly noticeable, which is not exactly the look most aquarists are hoping to achieve. 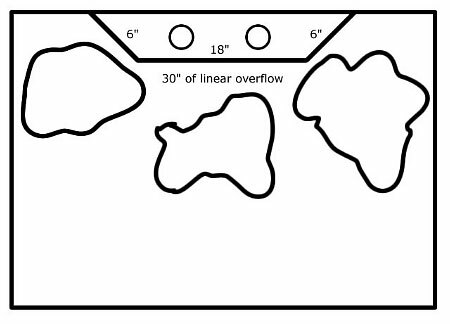 A much more visually pleasing solution is to put the overflow in the center and against the back wall of the tank, allowing the aquarist to aquascape to the back corners of the tank and, for the most part, hide the fact that the overflow is present. Often, this configuration will permit more linear overflow as well. The downside is that it will most likely mean custom drilling and overflow installation. In my opinion, it is still well worth the extra time and money to do it this way, if you can afford it. Generally speaking, the larger the drain hole is, the better things will work out all around. There are two attributes to flowing water that affect the noise levels. The first is the velocity of the water. The second is the amount of air bubbles mixed in the water. Both of these items are reduced when a larger drain is used, resulting in a system that is much easier to keep running quietly. The calculator mentioned earlier in the article can also be used to provide a rule of thumb for proper drain size. If you intend to install two drains instead of one, the results of the calculator cannot simply be halved, because, for example, the cross-sectional area of two 1" pipes is only 1.57" while the area of one 2" pipe is 3.14." In other words, two 1" pipes cannot handle the same amount of water as one 2" pipe, and, in fact, will handle far less. The correct formula to convert the results of the drain calculator for use with two pipes would be: the diameter returned by the calculator is represented by the letter d. sqrt((((d / 2)^2 * pi) / 2) / pi) * 2, so a 2" pipe would equate to sqrt((((2 / 2) ^ 2 * pi) / 2) / pi) * 2 = 1.42". Rounding up, two 1.5" pipes could handle the same flow as one 2" pipe. Ok, unless you are a math freak, you probably tuned out pretty quickly on the last paragraph. That's okay, there is a good rule of thumb that alleviates the need for the mathematics. All that needs to be done is to reduce one standard PVC size down from the results of the calculator and you should be safe. In other words, one 1.5" pipe could be replaced with two 1.25" pipes. Two 1" pipes could replace one 1.25" pipe. Even better would be to use two drains of the size recommended, which would allow one to be completely clogged, but the system could still handle the full flow without missing a beat. If the tank will be custom-drilled, don't forget to allow enough room between each of the holes and also the walls of the tank and the overflow box, for the bulkhead flange to fit. It's a common mistake to make. It's a good idea to purchase the bulkheads that are going to be used first, and then measure it several times to make sure it's right. "How to prevent your overflow from being a fish trap"
It happened a couple of years ago when I was going about a routine cleaning of a 150-gallon tank for a new customer. The owner and I talked at length about the stock in his tank and the problems he'd been having with a strange black algae. He patiently listened to my lecture on the importance of having a good skimmer and doing regular water changes. There was a substantial amount of nuisance algae in the tank, and I had been working in and around it for at least an hour, so I was getting a good feel for the tank's "personality." After cleaning the aquarium, I moved on to work on the filtration system. The sump was an acrylic wet/dry with a pre-filter shelf. It was nicely sized and barely fit in the cabinet. Because of this, the only way I could access the pre-filter to clean it out was to put my arm in all the way to the shoulder and work blindly. I could tell by the condition of the tank that it had been months since the filter had been cleaned, but I didn't expect what I found when I opened the shelf and grabbed the filter floss. I felt something slimy. My first thought was, "Man, this filter is just nasty dirty; it's a wonder things aren't doing even worse." Imagine my surprise when I pulled the floss out and a Snowflake eel squirmed out of my hand and flopped around on the hardwood floor like only an eel can do. After I stopped shivering with the willies, I scooped it up and put it back in the main tank. When the owner came over to see what all the commotion was, I calmly asked him if he had ever had an eel in the tank. He replied "I used too, but I haven't seen it for about three months," to which I responded, "Well, you still do." Then we had a long discussion about the importance of regularly cleaning his filtration. What's the point of my long and slimy story? Fish and other creatures including, but not limited to snails, hermit crabs, shrimp, and anemones, can and will find their way into your overflow and sump. Often, you won't even realize it's happened, much as the person in my story. Some of the fish might even find the water slide exhilarating. I once had a zebra goby that, despite my lectures, would make the trip several times a week before I finally managed to find an effective way to enforce the height restrictions on the ride. Even if the fish may seem to enjoy it, these events are to be avoided for several reasons. The most obvious of which is that it could be harmful, if not fatal, to the critter making the journey. Many times they will live for quite a while in the overflow, or the sump, if they make it that far in one piece. A dead fish caught in filter floss with high water flow can decompose in less than a day, creating an ammonia spike in the tank and leaving nothing but a skeleton. Even if they happen to make it safely to the sump, the danger is not over. 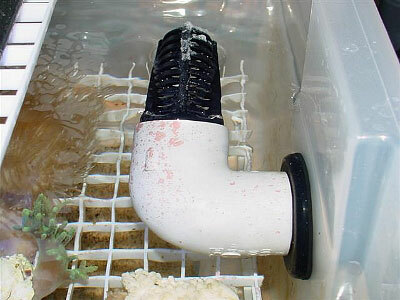 It is very common for a critter to get sucked into a pump inlet if they get too close, resulting in both a dead animal and a pump with a restricted intake. Slightly less obvious, but no less important, is the possibility of a critter clogging the drain plumbing and causing the tank to overflow, thereby flooding the room, followed shortly by the sump running dry. When a centrifugal pump runs without water to cool it, it can get hot enough to melt the coils and/or possibly even catch fire. Depending on the size and design of the plumbing, this can happen from just one snail wandering into the wrong place. The best tool in combating these tragedies is to properly minimize the layer of water going over the overflow as described earlier in this article. Having a thin water layer is the best way to make it difficult for critters to make their way into the plumbing. 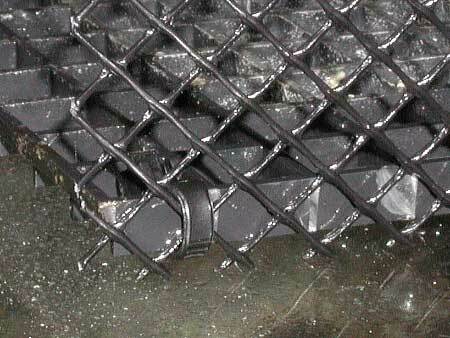 As can be seen in Figures 4-7 (below) some other basic tools for prevention are plastic gutter-guard and egg-crate. "jumpers" from jumping onto the egg-crate. 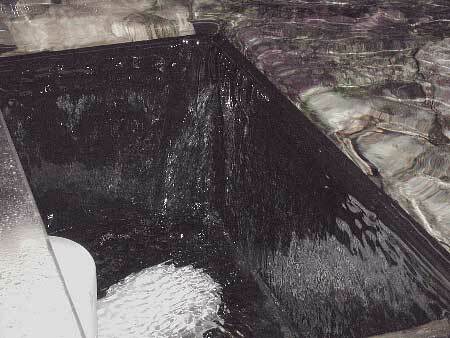 large overflow is handling 3000 gallons per hour with very little noise and hardly any splashing. No waterfall effect is occurring here, the water is sheeting right down the overflow wall. This is an excellent example of the benefits of a very large linear overflow size. the egg-crate and gutter-guard for periodic cleaning is imperative. overflow height is so "thin," it's all but impossible for something to get into the overflow. With proper forethought, it's not difficult to avoid the problems associated with having a sump plumbed into your aquarium system. Take the extra time to think things through before starting and much better results will be achieved. 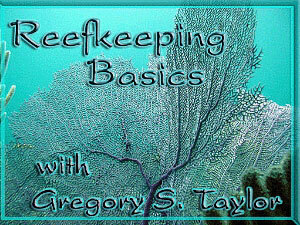 Acknowledgements: Special thanks for the content of this series go to everyone that participates in the DIY section of Reef Central, as well as those that have provided feedback in my author forum.